Each year our Webelos II Scouts take part in a 3-day, 2-night trip to Patriots Point and the USS Yorktown in Mount Pleasant, South Carolina. 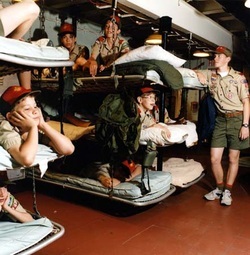 Once on board, our Scouts will experience the majesty of the USS YORKTOWN, sleep in the berthing areas where the sailors once slept, and learn about naval and aviation history. Camp on board the USS YORKTOWN Friday and Saturday nights. Meals on board include Saturday breakfast, lunch, and dinner, and Sunday breakfast. Friday dinner and Sunday lunch will be planned separately. Self-guided tours of aircraft carrier YORKTOWN, destroyer LAFFEY, submarine CLAMAGORE, and Vietnam Naval Support Base Camp. Specific travel details will be provided by your Den Leader at a later date.